Crafted in Italy by Ducabike. Fits all Ducatis with dry clutches from 1991-2011. 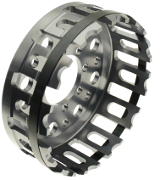 Ducabike Ultralight alloy clutch baskets are a fantastic upgrade for earlier Ducatis fitted with Steel clutches. Ducabike Ultralight baskets are the choice of many top Ducati race teams. 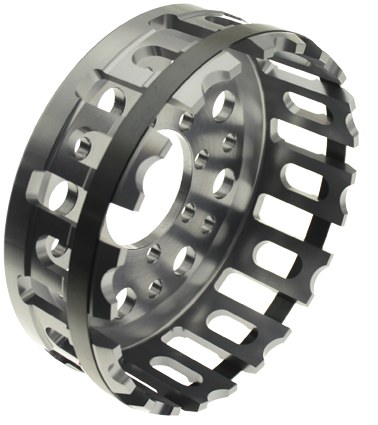 Bang for buck upgrading to a modern alloy clutch is the single best upgrade you can do to lighten rotating mass on your Ducati! Reducing the rotating mass will improve your engines responsiveness.The resulting reduction in gyroscopic forces also provides noticeable improvements in your bikes handling responses. Why makes the Ducabike clutch baskets the finest in the world? Crafted in Italy. These baskets are almost too beautiful to hide in your engine. We recommend you purchase a second one for your mantle piece. They make some of the competitors alloy baskets look like tractor parts. CNC Machined from a solid billet of ergal (7075-T6 aerospace alloy). Works with both slipper and non slipper Ducati dry clutches. Must be used with aluminum friction plates sets only. We recommend either FBG or Original Ducati aluminum clutch friction plate sets. Peter ****: "Hi Liam, the clutch basket just arrived...... I have had to ask people to leave the room, so that I can have a intimate moment alone with it.... it’s beautiful!